I am not going to lie, when this little package of loveliness landed on my desk, I did indeed let out a squeal of sheer delight. Why? Well as you may have noticed, I love reviewing Skincare and Make up, and, well, this is skincare from a huge Make up brand! Happy Days. 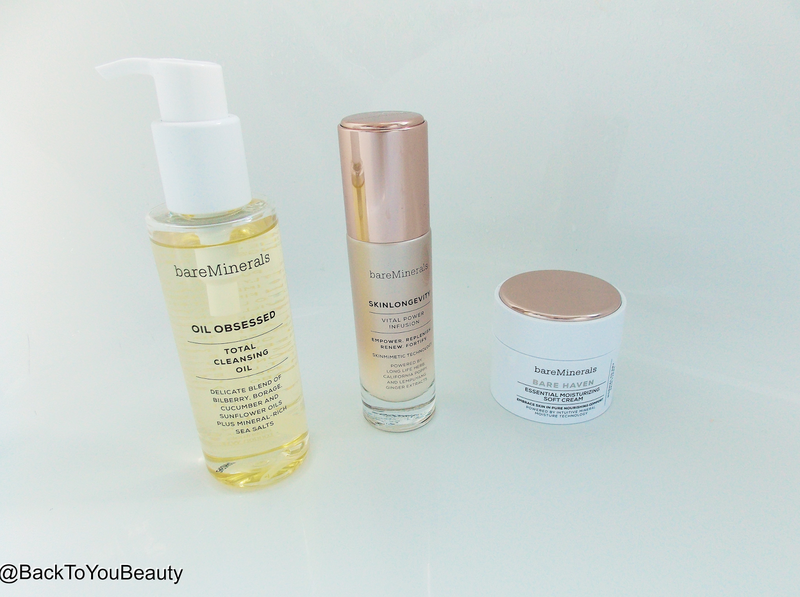 As you may have noticed from the title I am talking about the eagerly awaited and much anticipated UK launch of the Skinsorials Skincare collection from BareMinerals. What makes this range so different from others? I hear you cry! Well let me explain. The range will consist of a selection of four different cleansers, Serum and four different moisturisers designed for all skin types and concerns. This beautiful 3 part ritual of Purify, Empower and Moisturise, aims to give your skin exactly what it needs via texture, scent and ingredients. Today I will run you through the products I have been sent and tried. Oil Obsessed Total Cleansing Oil – I am thrilled I was sent the cleansing oil as I am “Obsessed” with them and was interested to see how this one would be so different from others. Wow was I surprised! The Ingredient’s in this oil are out of this world beautiful. Bilberry, Borage, Cucumber, sunflower Oils and mineral rich Sea salt, have all been expertly blended to create the most beautiful, uplifting, hydrating, lightweight cleansing oil. The first thing to hit you when you pump the oil is the Botanical scent, it is just beautiful, not cloying at all, but very fresh and relaxing at the same time. The suggested amount of oil to use is 3-4 pumps on the face but I like to use two pumps on my face, unless I am doing a treatment, which I will share in a mo. Gently rub in the oil onto dry skin and breathe in the scent, you can take it over the eyelashes as it also removes mascara and waterproof mascara very easily. When you have gently massaged it into the face and neck add some water to your fingers and rub over the face. This will turn the oil into a milky veil that will lift out and slough off the impurities and can be wiped away with a cloth. 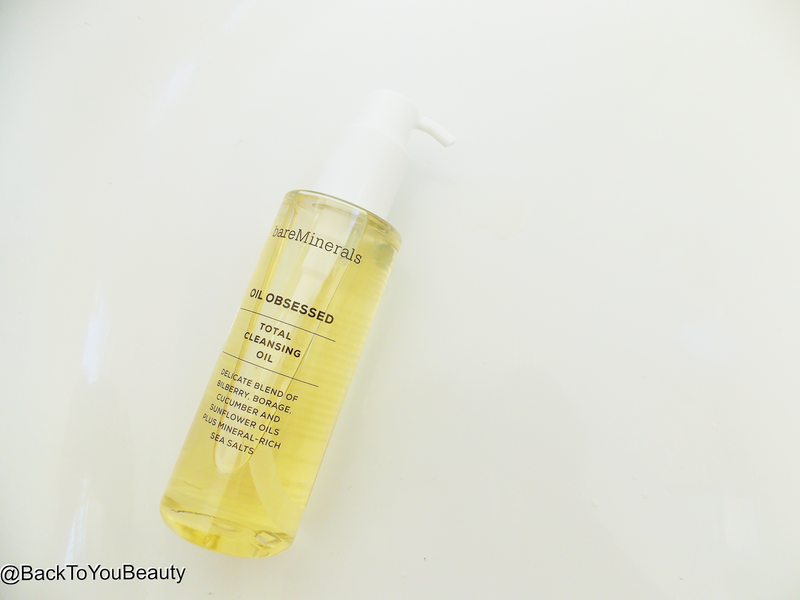 Straight away after first use you will notice softer, fresher, glowing looking skin that has no greasy residue left behind, thanks to the dryness of this oil. 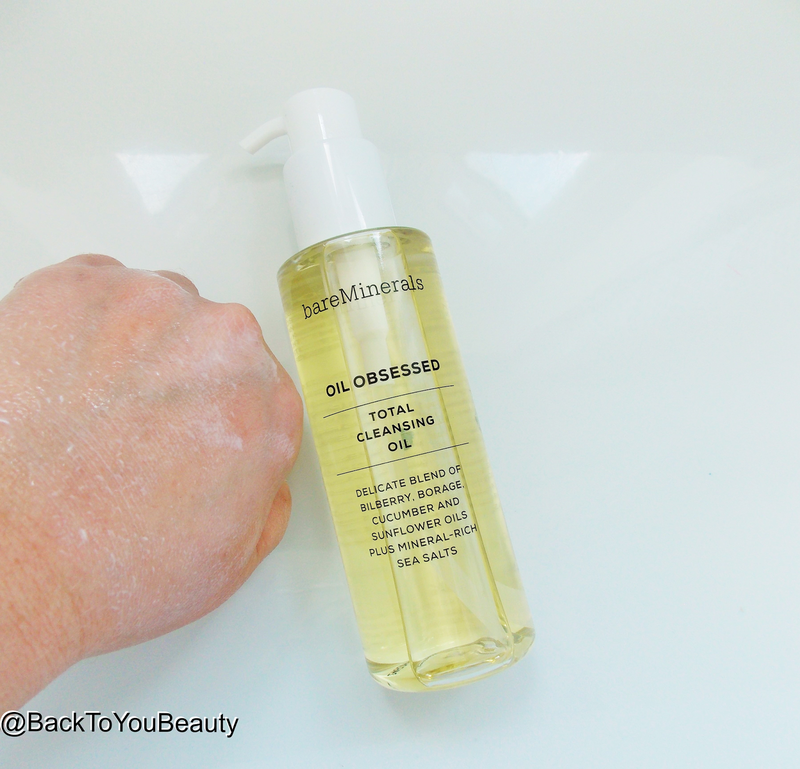 I love this oil so much and find it works so well on my dehydrated skin that a couple of nights a week I use 3-4 pumps, massage it in and leave it on my skin for the three minutes it takes to clean my teeth. 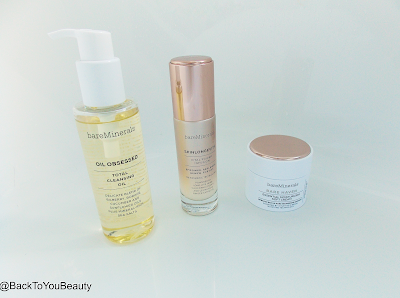 My skin really drink in these beautiful ingredient’s and looks and feels incredibly healthy. Great to use as part two of a “second-cleanse” routine. SKINLONGEVITY Vital Power Infusion – Part two in the 3 part ritual is Empower. This is all about empowering your skin to look healthy and younger! Firstly let me just give a moment for the outstanding packaging. The Rose Gold embossed, heavy, glass bottle, exudes class and looks so expensive. It looks beautiful on the bathroom shelf and for me that is a huge plus. Secondly this is an amazing serum. At the moment we are seeing a big Japanese influence flowing through make up and skincare products and whilst this range hasn’t been made to be “Trendy” it is on trend and certainly caught my attention. 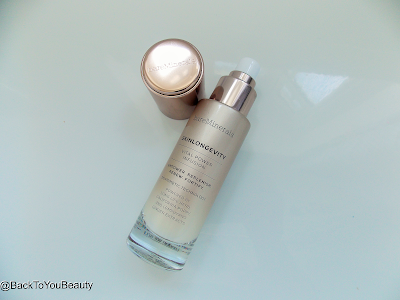 BareMinerals sourced the ingredients for this Serum from Okinawa in Japan which is an Island where women live longer than almost anywhere in the world! Their secret? Long Life Herb which is a mineral rich super food found in the coastal soil around the Island. There is a legend which says eating a bunch of this herb can increase life longevity by a day, so why not put it into skincare and feed the skin from the outside too? Sounds like a great plan to me! Add that to the other powerful ingredients including California Poppy and Lempuyany Ginger extracts, this serum essence really is all about awakening and brightening the skin whilst infusing it with moisture and vitality. Now you know I am addicted to my serums and you know that I have tried many, but I have never tried one with ingredients like this. This Serum is amazing. This is one of the lightest serums I have ever tried! You literally just need two pumps after cleansing and this is enough for your whole face and neck and you will immediately notice a glow, a radiance, as if you have used a gentle highlighter all over your face. It smells light and fresh and has a beautiful cooling consistency on the skin. What I love most is yes you see immediate results from the first use, but then after each use, day and night, over time my skin looks awake constantly, my hydration levels have increased and fine lines starting to lessen. 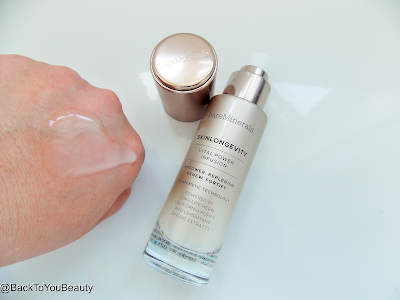 In my opinion, and I am shocked to say this, this is one of the best serums I have ever tried! Bare Haven Essential Moisturising Soft Cream – Now I know that in America they have four different moisturiser for each skin type , so can only assume that the UK will get the same. The one I have been sent to try is the Essential Moisturising soft cream for Normal to Dry skin. Again, the packaging of this 50g pot is lovely. The white pot with the classy looking Embossed Rose Gold Lid will make it really hard to dispose of when they are finished as they are so pretty. Formulated with Amino Acids, Peptides, Ceramides and subtle blends of Bergamot and Eucalyptus, this cream smoothes, hydrates and awakens the skin. I love the texture of this cream as it is light, which I know I have said about every product so far, but it really is. 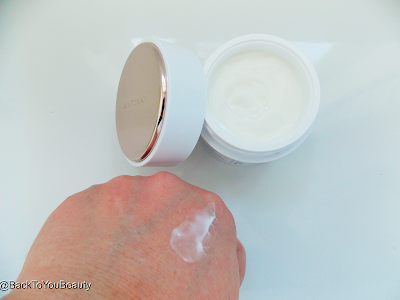 The smallest amount was easy to spread over my dehydrated skin and left my skin feeling soft and looking lovely. I would love to step up to the cream for dry skin as although mine is dehydrated as opposed to dry I think it would work perfectly on me. However if you have normal/dry skin this is great. 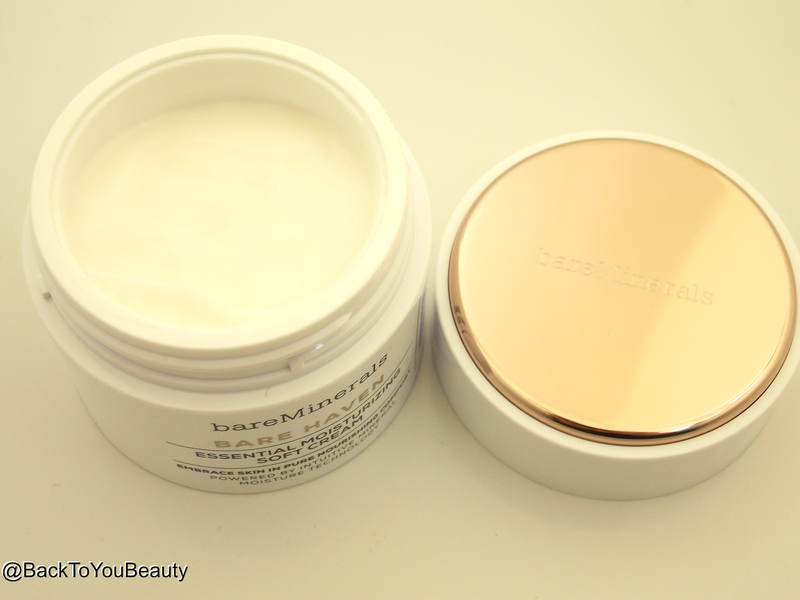 Completely fuss free, beautiful moisturiser that also works as a great base for make up. My Overall thoughts – This range has really blown me away! I wasn’t really sure what I was expecting from BareMinerals to be honest but this is super, high end skincare. The ingredients are beyond amazing, the texture of the 3 items I have tried are so light and easy to apply that its a great range for Spring and Summer. It is a quick, simple, regime that really will give you great skin that over time will continue to increase in hydration, vitality and overall texture. I am thoroughly impressed! All the scents in the products I have tried are very light and naturally derived, the products are suitable for all skin types as there is a product for everyone and all have been dermatology tested and will not block pores. The overall outstanding product for me is the SkinLongevity Vital power infusion serum, this will boost your skin and help any moisturiser you apply after, work better. 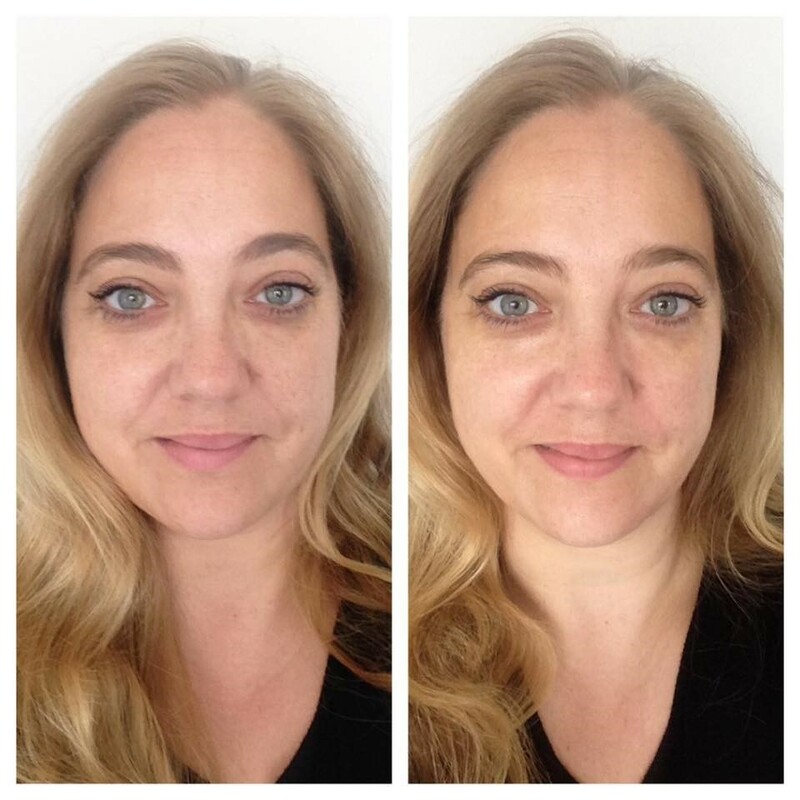 As you can see from my before and after photo below ( no retouching/filters used – only mascara worn in each) After just one use, it may be subtle but there is a definite glow and change in texture to my skin, with longer use my skin feels better and looks bright and healthy. The products will be getting their European launch first on QVCUK on Tuesday 3rd May and elsewhere from Bareminerals uk HERE from June. Click on each item above to purchase or for all BareMinerals items You can purchase HERE. 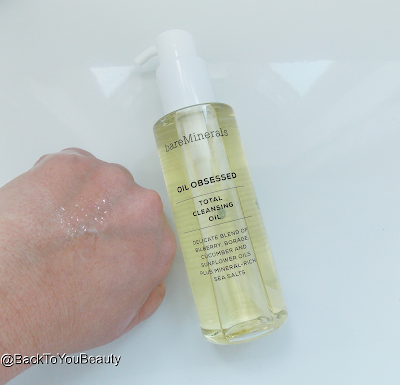 "Deep Cleanse your hair and scalp with the new Japense Mineral Springs sensation from OnZen"